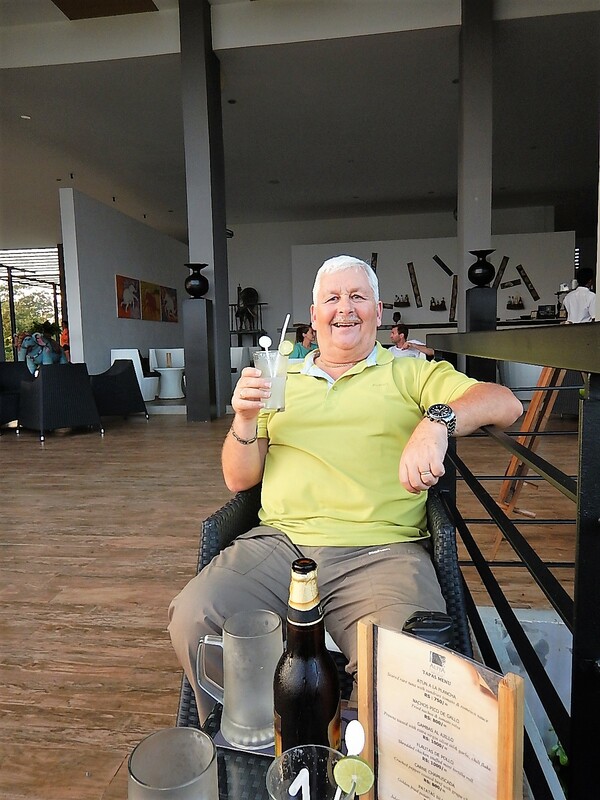 The next morning we left Colombo and drove to Habarana, a town with lots of hotels serving tourists visiting the Cultural Triangle defined by the ancient cities of Anuradhapura, Polonnaruwa and Kandy. The journey took about six hours and we stopped on the way at a simple roadside restaurant where we had the Sri Lankan staple of curry and rice which consists of a meat or fish curry served with plain rice and five vegetable accompaniments, it was a feast and we particularly enjoyed the eggplant curry and the lentil daal. Eventually we arrived at our hotel the Aliya Resort and Spa, we climbed the steps to the open reception and were greeted with the most amazing view across a huge infinity pool and over the landscape to Sigiriya Rock. Aliya has only been open a couple of years and it is a very modern but very lovely hotel with rooms set in blocks of four around a garden filled with trees, and paths which are lined at night by hundreds of lanterns. Next morning we set off early for Sigiriya Rock, a huge rock that rises over 200m above the plain, and another UNESCO World Heritage Site. Some sources say there are 1000 step leading to the top, others say 1200 steps, either way it had been looming large in my imagination as our journey led us towards Sri Lanka, I was determined to complete the climb but I can’t say I was looking forward to it! Leaving early meant we had time to visit the museum on site to gain a better understanding of the rock and its historical and cultural significance. From there we set off for the climb. The initial approach was through the ruins of a series of pleasure gardens laid out in 500AD. We climbed stone staircases to the base of the rock and then metal stairs suspended from the sheer rock walls – it’s not a place for the faint hearted! Half way up we took a detour up a spiral stair case to the fresco gallery, a long rock overhang decorated with beautiful frescos of traditional courtesans all painted hundreds of years ago. Back down the spiral staircase to the main route we completed our climb to a terrace where we could pause for breath, at the point where the terrace met the wall of the rock we could see two huge carved lion paws marking the start of the final climb to the top, originally the paws were part of a carved lion and you approached the rock through the lions mouth but now only the paws remain. The last part of the climb was steep, narrow and very busy, it was quite a challenge but there was no turning back. Finally we reached the summit and were greeted by the ruins of a large palace with ceremonial halls, a throne room with a throne carved from the rock, a large swimming pool and a series of garden terraces. It was a really astounding place which begged the question how did they build it 1500 years ago? The views were spectacular too. It took us an hour and a half to climb the rock and half an hour to get down again by which time we were ready to find a café and enjoy a cold drink, we had lassi with fruit, a thin yoghurt drink blended with tropical fruit juice, just the ticket. Not content with marching us up the rock and back Odi had planned an afternoon touring the ruined city of Polonnaruwa, second capital of Sri Lanka, it took about an hour to get there which gave us time to regroup. We really enjoyed exploring Polonnaruwa and Odi’s knowledge of the history of the site and the various temples brought the whole place to life. Towards the end of the afternoon as we were starting to flag we said perhaps it was time to head back to the hotel, Odi insisted we visit one last site, he had saved the best to last. We walked through a simple park watching the monkeys playing around the trees, we turned a corner to be greeted by a huge rock wall with three enormous statues of Buddha carved from the rock. One stood 7m high, one was seated and one was reclining and measured 14m long. They were over 1000 years old but by the condition and the simplicity of the carving they could easily have been modern statues. Tired but happy we returned to Aliya, stopping to buy fresh mangos from a stall by the road and eating them right there, we were back in time for a swim and dinner before collapsing into bed. Tired but happy with two drinks to look forward to! 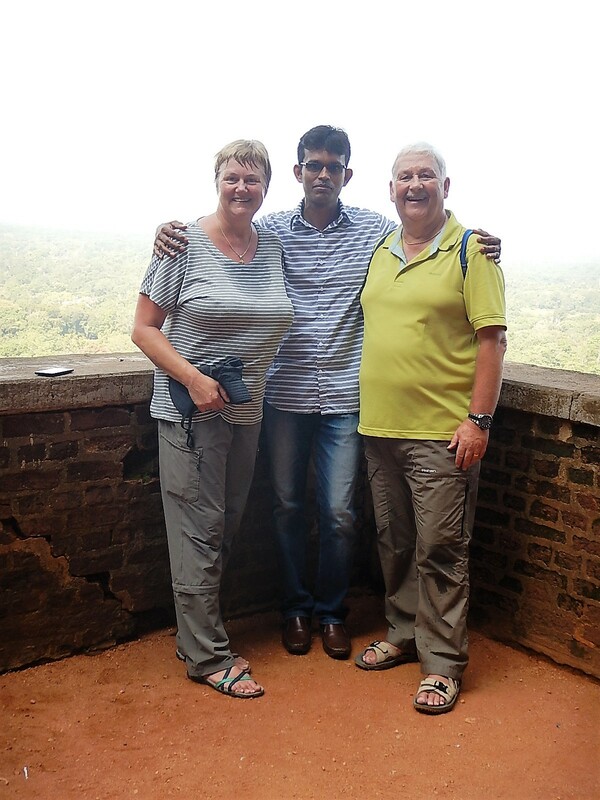 On our second full day at Aliya we had a morning at leisure which we spent by the pool looking out to Sigiriya rock and enjoying the knowledge that we had completed the climb successfully. At about 15.00 we met Odi and a Jeep and driver in front of the hotel and set off for a safari in the nearby Minneriya National Park. The park is known for its population of wild elephants and we were hopeful that we might spot some during our game drive, there were a lot of Jeeps in the park that afternoon but it didn’t feel like we were in a convoy. We drove through the jungle spotting signs of elephants and scouring the bush for sightings, eventually we emerged from the trees on to a flood plain next to Minneriya Lake, and there in from of us were dozens of elephants grazing and drinking from the lake. It was another truly amazing experience. We watched them for ages with the Jeeps gradually swapping positions in a large circle around the elephants giving us a chance to see them close up. Fantastic. When we finally drove away we headed along the edge of the lake and found another family of elephants and then climbed a lookout tower to take in the views across the lake and the park and out to the mountains beyond. That night Odi took us to a local restaurant about 10 minutes from the hotel, we would never have found it on our own, it was tucked down an alleyway behind a bungalow but it was great. The tables were on a terrace under a thatched roof, in the middle a chef was cooking roti (flat bread like Indian naan) over a wood fire in a stone hearth. We started with coconut roti with coconut sambal (grated coconut with chili, lime juice and salt) and a bowl of vegetable soup; next we shared a bbq platter with fish fillets cooked in banana leaves, prawn skewers, chicken, spicy rice and grilled pineapple; we finished with fresh fruit, it was a great experience and the food was delicious.